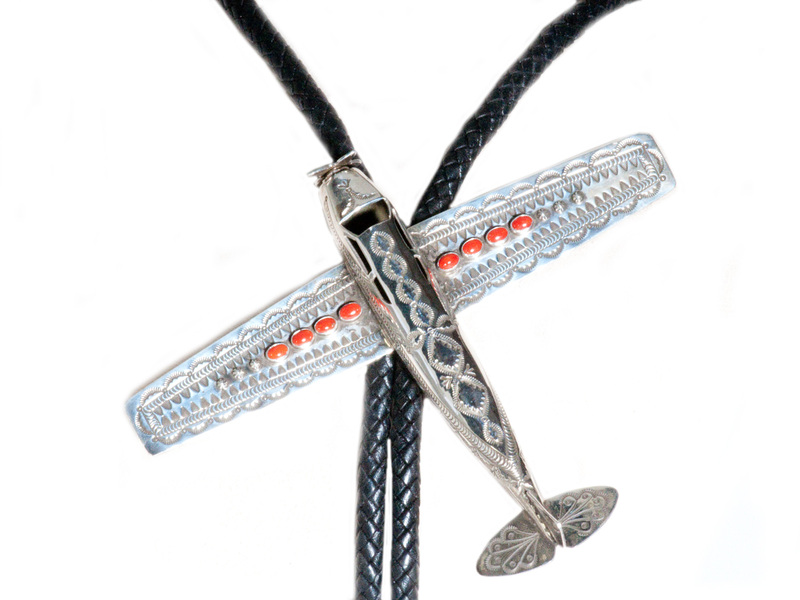 Sterling Silver Coral Airplane Bolo Tie handmade by Lee Charley. Sterling Silver Coral Airplane Bolo Tie handmade by the amazing Lee Charley. 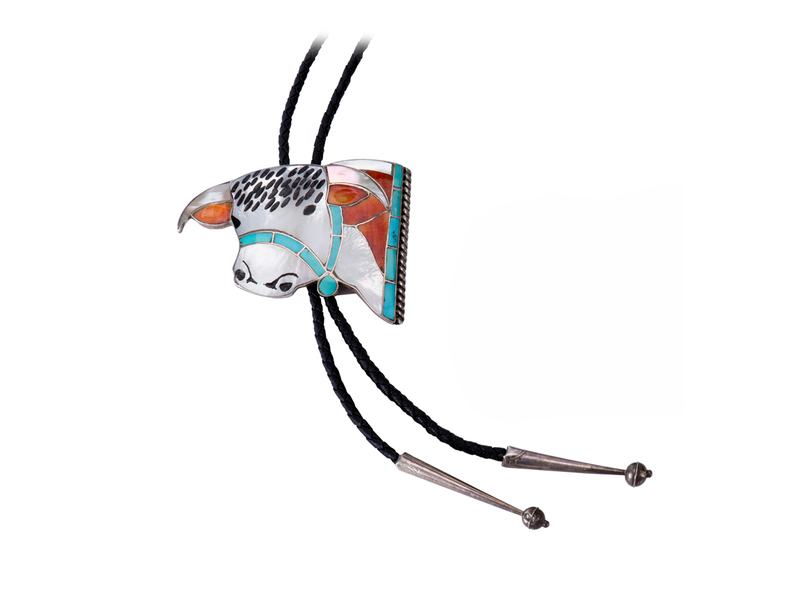 This fabulous bolo tie is a must have for the pilot in your life. 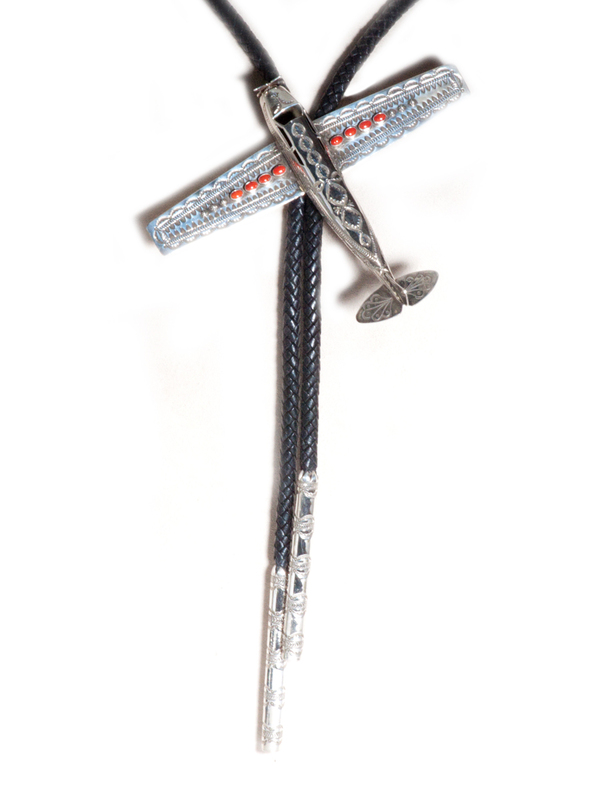 The bolo features hand stamped sterling silver in the shape of an airplane. The wings have 4 pieces of red coral on the wings. The propeller spins too. How amazing is that. The plane measures 5 1/4″ inch long by 6 1/2″ inches wide. 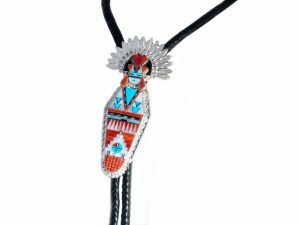 The leather cord is 47″ inches long with hand made sterling silver stamped tips at the end of the leather cords. Lee Charley has been described as “the Picasso of silverwork” to us and we love that! When you take a close look at his work, you see the perfection of every twist and turn in the silver. Each piece is unique, stunning, and incredibly detailed. His son, Matthew Charley, is also an extremely talented silversmith. Some of his work can be seen in this section as well. The History of Native American Jewelry is deeply rooted in the culture of the American Southwest. Certain historical processes have given American Indian jewelry a strong presence in today’s modern style. The use of Turquoise is by far the most influential aspect of ancient Indian jewelry used in modern western fashion. Archeological evidence supports the theory that stones, which include turquoise, shells, and carved fetishes, predate the Christian epoch. Turquoise that was found in Hohokam excavations in southern Arizona has dated back to 200 B.C. Even older in central Mexico, approximately 600-700 B.C., and in South America about 900 B.C. Native American Jewelry has a unique past. Knowing that story is the key to understanding the Indian jewelry styles of today. Native Americans started making silver jewelry in the late 1800’s when the Spaniards came, making jewelry, ornaments for their horses and trinkets for barter. But the Indian jewelry made before this time provided the foundation for their own style. Although the tribes and their styles vary, some common themes persist. There is significant evidence of beaded Turquoise jewelry. 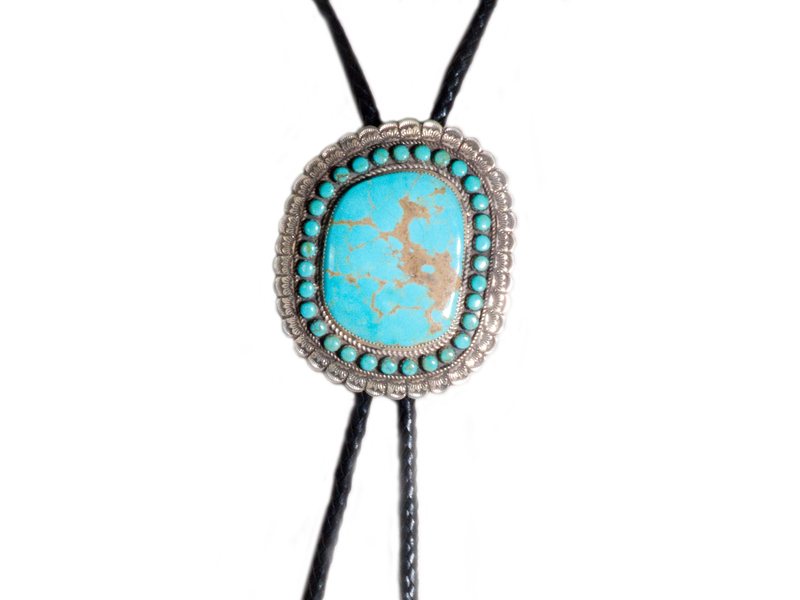 Turquoise and shell, paired with feathers would be strung and hung from every place possible. Yarn, leather, and sinew were woven into patterns and incorporated into necklaces, bracelets and clothing with the stones and shell. Other unique, beautiful items from nature would be included as much as possible. In Arizona this jewelry dates back over 2300 years, during the Hohokam era. Metal was rare but not out of the picture entirely. Some archeologists suggest gold and silver was worked by certain tribes in North America during this ancient time but its use would have been limited. Gold and Silver was worked by the Native peoples of Mexico and Central America since the time of the Aztec, so its possible Native American tribes living in the southwest region could be aware of metal working in some way much earlier than the Spanish arrival. It is even difficult to put a date on just when the Native Americans started making silver jewelry after the Spanish arrival. Some authorities will say the 1870’s some the 1890’s.